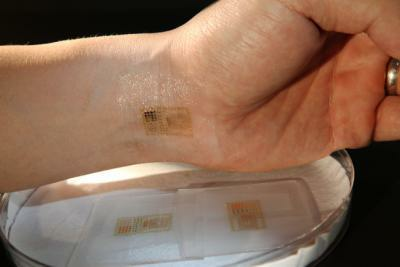 Led by John A. Rogers, the Lee J. Flory Founder Chair in Engineering Innovation at Illinois, the researchers described their novel skin-mounted electronics in the Aug. 12 issue of the journal Science. “We threw everything in our bag of tricks onto that platform, and then added a few other new ideas on top of those, to show that we could make it work,” said Rogers, a professor of materials science and engineering, of chemistry, of mechanical science and engineering, of bioengineering, and of electrical and computer engineering. He also is affiliated with the Frederick Seitz Materials Research Laboratory and the Beckman Institute for Advanced Science and Technology at Illinois. Electronics mounted directly to the skin, with no need for wires, conductive gel or pins. They bend, stretch and deform with the same mechanical properties of skin, granting the wearer comfort and freedom of movement. 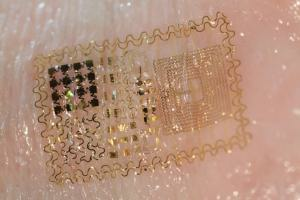 Skin-mounted electronics have many biomedical applications, including EEG and EMG sensors to monitor nerve and muscle activity. One major advantage of skin-like circuits is that they dont require conductive gel, tape, skin-penetrating pins or bulky wires, which can be uncomfortable for the user and limit coupling efficiency. They are much more comfortable and less cumbersome than traditional electrodes and give the wearers complete freedom of movement. Rogers’ research group is well known for its innovative stretchable, flexible devices, but creating devices that could comfortably contort with the skin required a new fabrication paradigm. Contact: John A. Rogers, Department of Materials Science and Engineering, 217/244-4979. Device photos courtesy of John Rogers.